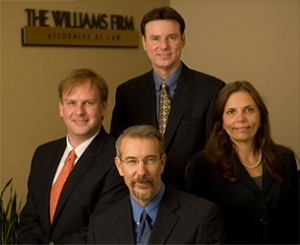 The Williams Firm’s history of success dates back to 1995, when attorney Timothy C. Williams founded his own firm. Today four attorneys, all of whom have a background practicing at large law firms, bring creative legal solutions to the Firm’s clients. The Williams Firm is a boutique law firm in Walnut Creek, California, conveniently located in San Francisco’s East Bay that focuses on a relatively narrow range of legal practice areas. To arrange a free one-half hour consultation regarding your legal matter, please do not hesitate to contact the Firm. The experienced attorneys of the Firm are committed to providing clients with the same quality legal representation associated with a large law firm at a more cost-effective rate. In addition, the Firm provides clients with responsive, personal services. Telephone calls and other communications are returned promptly and clients are kept informed of important developments. A high priority is placed on the ability to perform a quick but careful analysis of client issues and to develop creative legal strategies to meet client goals. Thoughtful analysis yields better results for clients than taking action just for the sake of acting. While the Firm’s attorneys are capable of handling the most complex legal matters, they are friendly, approachable and able to translate complex legal issues into clear language anyone can understand. For sophisticated legal representation and personal service at cost-effective rates, you can depend on The Williams Firm. Contact the business law, real estate, construction, and intellectual property attorneys at The Williams Firm in Walnut Creek, California today.